January 27, 2019 marked the two-year anniversary of the “Muslim” or “Travel Ban.” Today, this version remains in full effect because of a Supreme Court decision issued last June and an earlier decision by the Court. This post explains the current application of Travel Ban 3.0. On January 19, 2018, the Supreme Court agreed to hear arguments on the legality of Travel Ban 3.0. In the lower courts, the legal challenges to Travel Ban 3.0 were wide ranging. The challenges were constitutional and statutory. Whereas the Hawaii court focused on the statutory arguments to conclude that Travel Ban 3.0 violates the immigration statute by denying immigrant visas based on nationality, the Maryland court focused on the likelihood that Travel Ban 3.0 violates the Establishment Clause of the First Amendment to the U.S. Constitution. On December 4, 2017 the Supreme Court issued orders staying the injunctions placed on certain aspects of Travel Ban 3.0 by federal district courts in Hawaii and Maryland pending a decision by the appellate courts and the Supreme Court. On this date, the Court did not make a decision on the legality of the ban. What this means is that Travel Ban 3.0 took full effect on December 4, 2017. The Government appealed the Maryland and Hawaii decisions. On December 22, 2017, the Ninth Circuit Court of Appeals ruled that the plaintiffs are likely to succeed on the claim that the Proclamation violates the Immigration and Nationality Act. On February 15, 2018, the Fourth Circuit Court of Appeals ruled that the plaintiffs are likely to succeed on the claim that the ban violates the First Amendment of the U.S. Constitution and found that the Proclamation is “unconstitutionally tainted with animus toward Islam.” Both appellate courts limited the injunction to those with bona fide relationships and stayed their decisions pending a decision by the Supreme Court. On April 10, 2018, the White House announced that Chad would be removed from the travel ban after finding that the country met “baseline” security standards. On June 26, 2018, the Supreme Court of the United States issued an opinion in the case of Trump v. Hawaii. (Travel Ban 3.0). Writing for the five-justice majority, Chief Justice Roberts held [that President Trump’s travel ban does not violate the constitution or the Immigration and Nationality Act (INA)]. The Proclamation remains in full force indefinitely. If a person is covered by the ban and does not qualify for an exemption, a consular officer may, on a case-by-case basis and within their discretion, grant a waiver to affected immigrants for certain reasons. The person seeking entry must prove that: 1) denying entry would cause the foreign national undue hardship; 2) entry would not pose a threat to the national security or public safety of the United States; and 3) entry would be in the national interest. According to the Department of State, “As of January 15, 2019, 2,584 applicants were cleared for waivers after a consular officer determined the applicants satisfied all criteria and completed all required processing. Many of those applicants already have received their visas.” By contrast, critics have challenged the waiver scheme both in the courts of law and in the court of public opinion. For detailed instructions on how to prepare a waiver request packet, or for assistance, impacted individuals should consult with an immigration attorney. 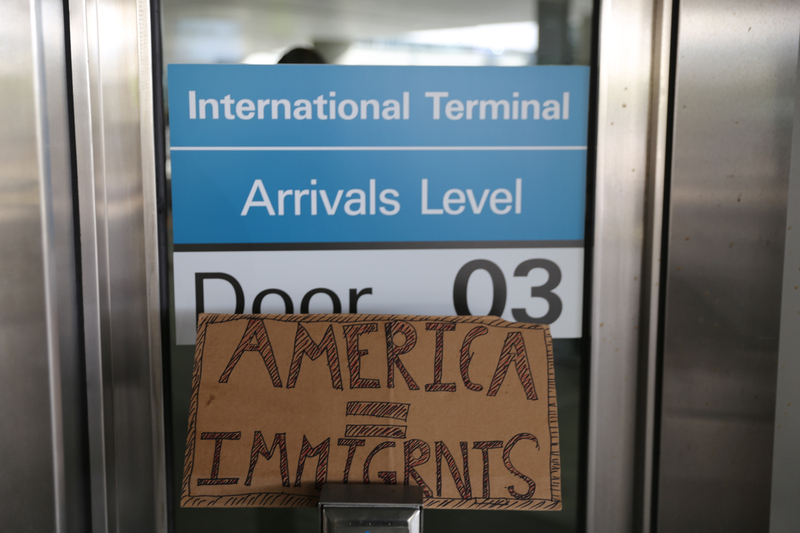 The Middle East Interest Group of the American Immigration Lawyers Association (AILA) has developed a practice pointer for seeking a waiver. *Adapted from a Medium Post, By: Shoba Sivaprasad Wadhia, Sirine Shebaya and Abed Ayoub and a Fact Sheet from Penn State Law Center for Immigrants’ Rights Clinic. This document does not constitute legal advice. It was updated at 8:30pm on 1/28/2019.